This coursebook helps students take an active approach to developing and applying the key reading and writing skills they need to succeed in their AS & A Level English Language course. In the first part of this digital edition, for AS Level, students will learn to analyse and write different text types, from diaries and blogs to reviews, speeches and narratives. 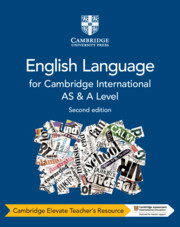 The second part supports A Level study, building on the skills students have learnt at AS level and applying them to four specialist areas: Language Change, Child Language Acquisition, English and the World, and Language and the Self. Helps students to prepare for the examination, with opportunities for assessment and step-by-step guides to different question types.